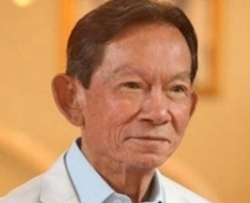 BANGKOK, Feb 16 – Veteran politician and Lower House MP Sanan Kachornprasart died at Siriraj Hospital on Friday of acute blood infection. He was 78. The MP of Chat Thai Pattana, a smaller political party in the government bloc, was admitted to the hospital on Nov 22 last year after suffering from emphysema. Maj Gen Sanan, survived by his wife Chaweewan and four children, entered Thai politics as an executive member of the Democrat Party in 1983. He held various ministerial posts including deputy communication minister (1986-1988), agriculture and cooperatives minister (1988-1990), deputy prime minister (1990), industry minister (1992-1994), interior minister (1994-1995) and deputy prime minister/interior minister (1997-2000). Sanan, holding the title of lieutenant in 1977, was dismissed from the army service and imprisoned for collaborating in an abortive coup. He was later bestowed the rank of major general while serving as interior minister. Maj Gen Sanan and his son, Siriwat Kachornprasart, joined the Chat Thai Party (later dissolved and reincarnated as Chat Thai Pattana Party) in 2007 after which he was appointed a deputy prime minister in the Samak Sundaravej government. He then called it quits from Thai politics and his position as chief advisor of the Chat Thai Pattana Party on March 12 last year due to deteriorating health. His status as a party list MP under the Chat Thai Pattana banner will be replaced by Piyapant Champasut, the former deputy permanent secretary for transport, who ranks 6th on the party list.